Seen here is the glassy calm off Kip Marina at 10am on 19th May and also the tail of our new Flag AP. Tom Hutchison on committee boat Aquaholic having chosen Course 1 around Garroch Head wisely made the choice to postpone and shepherd the 9 strong fleet to the north end of of the Cumbrae where a start was called at 11.20 using a couple of the HUN can buoys as the start line As can be seen in the next photo sails were filled for an enjoyable beat in around 10kts of breeze and welcome bright sunshine. 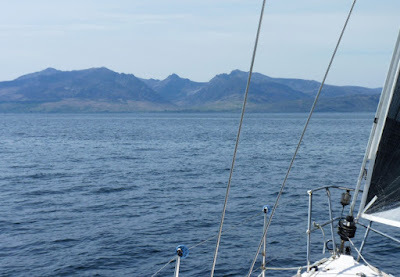 Close hauled on port tack the best that could be done was head for the Bute shore around Kilchattan where some short tacking through calm patches eventually allowed a rounding of Garroch Head where we were treated to the magnificent spectacle of the Arran ridges. 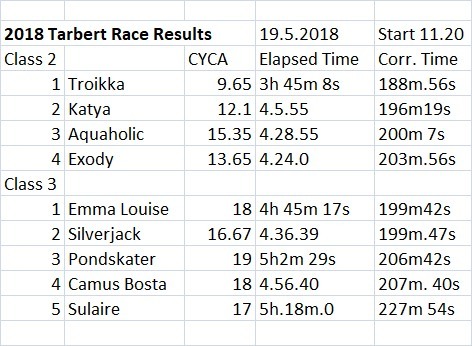 Troikka having pulled away somewhat lost sight of the following fleet and continued broad reaching towards Skipness. The benign conditions seen below eventually livened considerably as the wind veered substantially to the west with gusts up to 25kts or so giving a fast passage onwards. The Commodore accompanied by Marge on Black Pepper was on hand in Tarbert to welcome arrivals and in the wind whistling through the pontoons there were several less than tidy coming alongsides. All however were in good spirits having enjoyed a splendid sail and it was good to have Robert and Audrey Yule back afloat and out for the first time on their new Moody 36 'Sulaire' . Once they have figured it all out they should be real contenders in Class 3. There was plenty of time for some conviviality and drinks on board before the gathering in the Scottish Series marquee which conveniently had been erected in time. 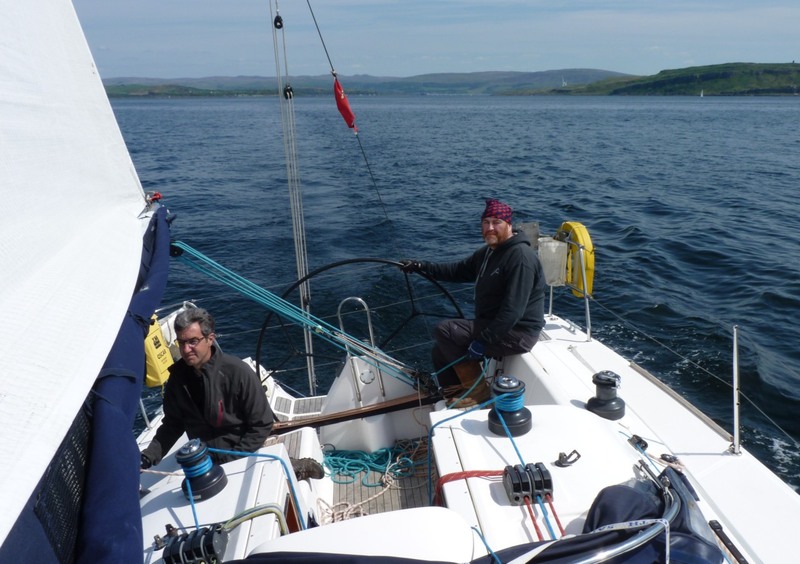 We were pleased to welcome Geoff and Jackie Orr on their Hallberg Rassy, 'Jackanory' and hope that we will see them again as members at subsequent events. After that it was on to the Starfish as per usual where the meal, some thought, exceeded previous efforts and also as usual the reading out of the results. 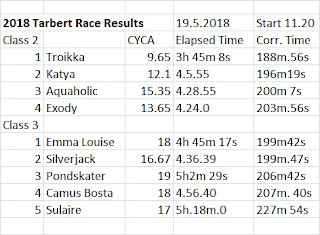 The corrected times in some instances are startlingly close.